Fort Madison City Hall is located at 811 Avenue E, Fort Madison, IA 52627; phone: 319-372-7700. Photo: Albright House, ca. 1858, 716-718 Avenue F, Fort Madison, IA. Listed on the National Register of Historic Places in 1978. Photographed by User:Nyttend (own work), 2014 [cc0-by-1.0 (creativecommons.org/publicdomain/zero/1.0/deed.en], via Wikimedia Commons, accessed July, 2015. 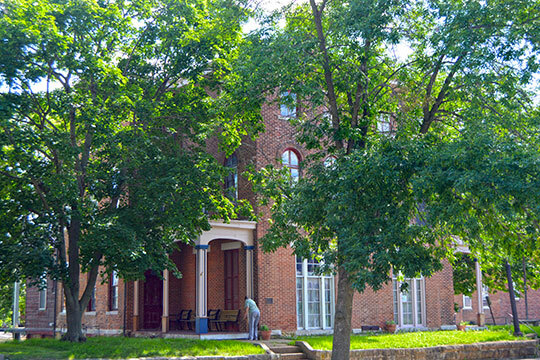 Fort Madison, along with Keokuk, serves as a seat of government for Lee County. Fort Madison was opened for settlement in 1833, shortly after the land was acquired by the U.S. government in the Black Hawk Purchase of 1832. The original town plat of 1836 included 18 blocks east-west along the Mississippi River (what is now 1st to 18th streets), and 9 blocks north of the river. Old Settlers Parks and Central Park were designated as public squares as part of the original plat. The city was incorporated in 1838, and throughout the next decade Fort Madison established a post office and newspaper, created ferry service across the river, and secured the Iowa State Penitentiary and the position of county seat. By 1850, Fort Madison was home to 1,500 people, making it the 6th largest city in Iowa. Fort Madison continued to experience moderate growth throughout the 1870s and early 1880s, but the 1887 arrival of the Sante Fe railroad and its associated bridge across the River kicked off significant growth, taking Fort Madison from 5,000 in 1885 to 9,000 in 1900. A streetcar line was built to connect the east end of Fort Madison to the west end, facilitating the development of the Sante Fe shops and Ivanhoe Park, which became a central community attraction, featuring a bandstand, a lake, an amusement park, and a zoo. By 1889, new additions were platted out to 33rd Street south of Avenue G and to 40th street south of Avenue L. Many of these western additions had narrower, less expensive lots geared toward railroad workers. Although Fort Madison was growing west, the downtown business district continued to be the city's primary retail and commercial area. In the early part of the 20th century, new business and residential development continued in the original town plat and in western additions. The completion of the hydro-electric dam in Keokuk in 1912 reduced electric costs significantly and spurred industrial growth, particularly industry related to the agricultural base. Fort Madison capitalized on its supply of flat, drained land, the Sante Fe Rail and Burlington Rail lines, steamboat service, and the dam to become a manufacturing and shipping center. Sheaffer Pen Company opened in 1906, and by 1917, employed 100 workers (it would eventually grow to 1,800 workers in 1950, and become the largest pen company in the world). New residential neighborhoods were established throughout the early 1900s to accommodate railroad and industrial workers, including a large addition in 1914 called "Factoria" that extended to the western boundary of town at 36th to provide additional lots for industry and nearby worker housing. When temporary workers were hired for expansions of buildings and rail lines during World War I, many of the workers and their families found permanent homes in Fort Madison, including many Mexican immigrants. By 1920, the population had reached approximately 12,000, and would continue to grow until peaking in 1960. Steady economic growth continued throughout the 1920s, with the majority of residential development occurring in the western part of town, and prime real estate beginning to occur on top of the bluffs. During the Depression, large employers like Sheaffer Pen and the Railroad helped keep the economy afloat, but construction was limited throughout the 30s and 40s, and population growth slowed. As automobile use increased, more business development occurred outside downtown, primarily to the west. During World War II, much of the industry in Fort Madison converted to war-related production. City of Fort Madison, Iowa, Comprehensive Plan, 2013, www.fortmadison-ia.com, accessed July, 2015.